What Do Millenial Travelers Want From Your Destination? Millennials want to travel more than older generations. They’re spontaneous and live for adventure because it creates memories. Millennials love travel so much that 78% say they’d splurge on experiences over material things. They’re also a growing force that generates $180 billion in annual tourism revenue. So what should you know about this traveling generation? First, their budgets are not strictly frugal. 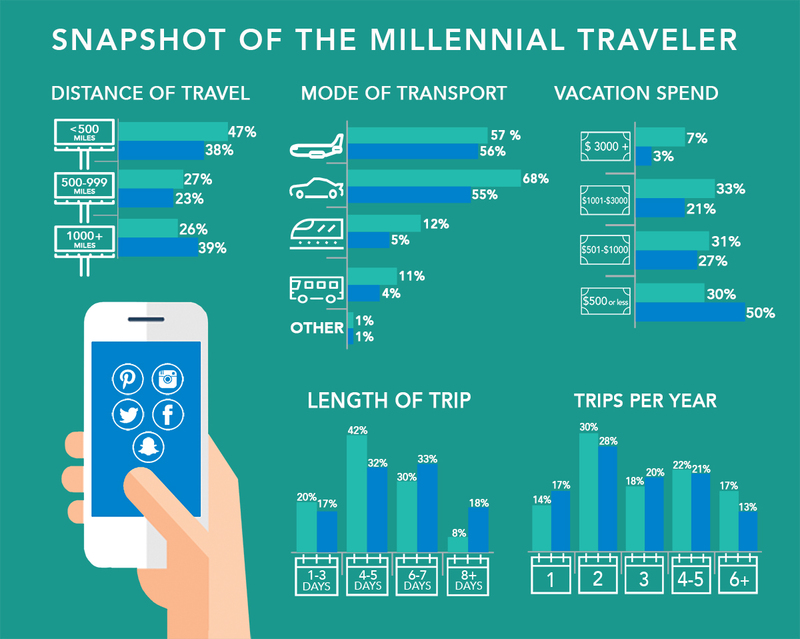 Millennials tend to try to save on hotel and transportation costs by staying in hostels or campsites and driving instead of flying. Yet, they’ll shell out the big bucks on fancy meals and unique activities. The average Millennial spends $500 or less on a vacation. They save on the usual things and spend on the experiences. Secondly, they’re in their prime. Millennials are able to camp, backpack, and walk a ton. They can explore a city during the day and still hit the bars at night. With this level of energy, it’s no surprise that Millennials like to fit as much activity as they can within a short period of time. The average Millennial only takes 2 to 4 trips a year, with most trips lasting 4 to 5 days. With 68% choosing car as their main mode of transport, they are likely to drive somewhere that is within 500 miles of their home. Finally, they’re social. They thrive on social media, using it to book activities and lodgings as well as to share their adventures with friends and family. Beyond the virtual world, Millennials also view travel as an opportunity to bond socially with friends they’re traveling with. Many hotels are accommodating the social nature of Millennials by creating hotel brands that are design-focused and technologically equipped. These hotels cater to Millennials by making Wi-Fi and social common areas the core of their architecture. Stand out in the eyes of Millennials by highlighting immersive experiences and emphasizing affordability. What makes your town special? Whether it’s a delicious dish by a local restaurant or an annual festival, it’s bound to hook a Millennial. To read more of our in-depth traveler profile series, please click here. To learn about Marketing To A Millenial from a Millenial's perspective, please click here.